From director David R. Ellis, who gave us the best and worst sequels from the Final Destination series, comes the latest 3D horror film to see a bunch of teenagers splattered across our screens. One can only assume that this film got the green light as a result of the success of Piranha 3D although the similarities are few and far between. 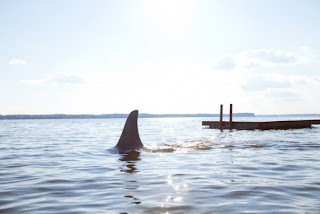 Shark Night certainly starts off cliched enough, with a group of seven under-grads heading to one of their friends remote island vacation homes in Louisiana. They meet a couple of hillbilly locals along the way and also have an encounter with the local law enforcement that reminds you that at least one of their party used to live out this way, but left for reasons no doubt pivotal to the forthcoming events. Anyhow lots of water sports ensue and a shark attack occurs and a lot of blame laying between the so-called friends gets thrown around before it becomes clear that the shark attack was no accident. In fact there appear to be a number of sharks and from various breeds in the lake, all with a taste for teenage flesh. Shark Night is one of those movies that takes itself far too seriously! From its opening Jaws rip off to its ludicrous explanation of why these events are occurring and its weirdly toned down violence (Obviously to attract younger audiences with a more "acceptable" rating) the whole film makes for a fairly pointless encounter. Even the 3D is somewhat pointless. These movies are made to exploit the gimmick of 3D, so when they take themselves too seriously and don't play to that gimmick then why did they bother filming it in 3D?